Anne Hornigold, Chief Executive, 54 North Maritime Training, has been heavily involved in the Maritime Industry for over 13 years, training apprentices and adults into maritime careers. She has raised the profile of the company UK wide, working strategically at all levels, from routine to ministerial level. Working closely with the MCA, the Maritime Skills Alliance, National Workboat Association and Trinity House, to name but a few, she is recognised for the establishment of excellence in maritime safety training, initially in the fishing industry, and latterly in the workboat industry. 54 North Maritime Training, under Anne’s guidance, has received many quality and excellence awards. The company considers safety training is paramount, and has an outstanding safety record. Anne’s introduction of a robust safety training programme has resulted, to date, in no major accidents or deaths for anyone trained by the company. Currently, 54 North Maritime Training are the only UK training provider successfully delivering the new Workboat Apprenticeship. In 2013 she became a Fellow of the Chartered Management Institute. 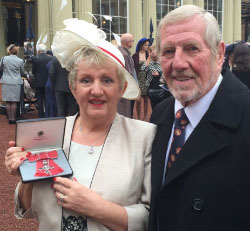 Anne was thrilled to be awarded an MBE in the Queen’s Birthday Honour’s list in June 2014, for Services to Education. The company’s new Apprenticeship in Maritime Studies – Workboats was introduced during 2014/15 at the Training Centre, of which is the first training centre in the UK to deliver this training specifically tailored to cover many workboat disciplines. A stalwart of the U.K.s fishing industry has been named in the Queen’s Birthday Honours List. Anne Hornigold, Chief Executive at the Whitby & District Fishing Industry Training School, has been awarded an MBE for Services to Education in the Sea Fishing Industry. She told colleagues that she was “thrilled” when she found out she was in line for the award. Mrs Hornigold said: “I went on holiday and when I came back in May there was a letter on the mat. I was completely surprised! It was extremely difficult to keep the secret until the Queen’s Birthday Honours List was announced. My family and colleagues are very pleased for me. I feel very honoured”. Anne’s background has been one of business development, working on Teesside until moving to Whitby and marrying her husband Tony. Anne has been involved with the training school since 2000, when an idea, formed by Arnold Locker of Lockers Trawlers, was translated into reality when the school opened in 2002. The Board of Directors of the non-profit making company are extremely supportive, with Anne being one of the three remaining founder directors of the company. Anne was instrumental in the formation of the company, whilst Tony, her husband, was the first Director of Training at the school, setting up the classrooms and facilities to ensure the training ran smoothly. The training centre has had many challenges to face due to various educational requirements and changes, but the board and all the staff have risen to the challenges and overcome them one by one. “The company could not have got where it is today without the unfailing support from skippers and crews who train the apprentices, the landladies and landlords who accommodate them, and the staff, who are to be highly praised for their unstinting flexibility and loyalty” said Anne, “the company would not have continued without us all pulling together. At times some of the challenges seemed insurmountable, but we have always made it through”. 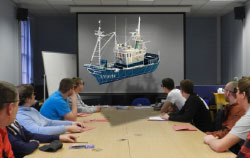 The company has won many awards for the quality and innovative practices used when teaching the apprentices, in particular for the use of bespoke 3D software which introduces the new apprentices to how life on board a trawler will be. 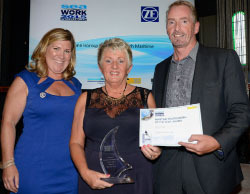 During July 2013, Anne was presented to Prince Charles, as one of many companies running projects under the MMO funded Holderness Coast Fishermen’s Local Action Group, and she is now looking forward to travelling to London to receive her award. Ground-Hog day for the Fishing School! Whitby & District Fishing Industry Training School is pleased to announce a further nomination for an award, this time for the Times Educational Supplement Further Education Awards 2014. The awards recognise the dedication and expertise of the people who, on a daily basis make a significant contribution to improving the skill levels of young people and adult learners. Whitby Fishing School has been shortlisted for the category of ‘Outstanding use of Technology in Further Education’ and is now a finalist in recognition of their training with the use of bespoke 3-D software and which is unique in the industry. Chief Executive Anne Hornigold said; “This is a fabulous start to the year. To be shortlisted as a finalist is excellent national recognition for the company and we are looking forward to attending in London, in the hope of bringing back this prestigious award”. The awards dinner and ceremony will take place on Friday 28 February at the Park Plaza, London. It promises to be a spectacular event with over 500 guests expected to attend, including government ministers and many of the great and good from the education sector. Winners will receive a specially commissioned trophy and all finalists receive certificates in recognition of their achievement. Whitby Fishing School – National Finalists – Going for Gold! Whitby & District Fishing Industry Training School is in line to receive a major National Management and Leadership Award. The school has received notification from the Chartered Management Institute that they are a finalist in the prestigious “Outstanding Training Provider of the Year Award”. The school received notification from the Chartered Management Institute late last Friday afternoon. “We were so excited – I rang everyone I could think of and just floated home on a cloud” said Anne, “The success of the school can be put down to our dedicated team of staff, the skippers who train them, and the landladies and landlords who take our trainees into their homes and look after them like their own”, said Anne, “The skippers have supported the school excellently. They have taken on apprentices year after year – the apprenticeship couldn’t run without them”. From a ‘standing start’ in 2002, the school has continued to achieve national recognition for its innovative high quality training methods, and over the past ten years with the support of the Sea Fish Industry Authority have received several other awards - initially, the Whitby Gazette’s “Pride of Whitby Business Award” in 2006, and later achieved the “Evolution Technical Award” for the delivery of training via our 3D software system. The school was ranked top in the U.K. after a quality audit completed by the Sea Fish Industry Authority, and has also maintained the quality mark Customer First over the last six years. Arnold Locker, Chair said “Anne is an exceptionally hard working CEO. She combines vision and an ability to plan strategically with the day to day practical skills to ‘get the job done. Her interpersonal and management skills are of the highest order and she sets and expects high standards from those who work alongside her. She enjoys the support and trust of the Board, all staff and tutors, the trainees and members of the industry with whom she comes into contact. From humble beginnings ten years ago the school has made steady progress and we now consider we are a centre of excellence”. The fishing school is unique in that it is the only training centre in the U.K. to deliver the Level 2 Apprenticeship – Maritime Studies Sea Fishing and the only centre who have managed to sustain the delivery of extremely difficult to achieve training. 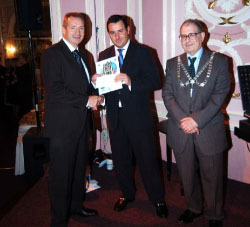 During 2010 Whitby Fishing School was successful in winning a national award, the Evolution Awards. This was for the success in obtaining funding for, and producing a 3D safety training system for fishermen and apprentices. Trainees can experience a virtual tour of a fishing vessel which takes them to various areas of the vessel, including the wheelhouse, the decks, galley and bunks and demonstrates what they can expect once they go to sea. All items are labelled and they can begin to learn how and where equipment is stored and laid out – all within the classroom. Having left the comforts of their home environment, the learners gain some reassurance about the challenges facing them in a difficult and dangerous industry. Whitby & District Fishing Industry Training School has been successful in achieving another award! Instigated by the local newspaper, the Whitby Gazette, the ‘Pride of Whitby Awards’ have been celebrated this September with the fishing school gaining the top prize in the Business Award category, sponsored by local firm Colin Brown & Kidson. The school was nominated by local restauranteurs Rob and Emma Green of Greens of Whitby whose restaurant is in the centre of town and who use only the best fresh Whitby catch and local game in their menus. Rob and Emma are sponsors of the school and have funded a professionally produced web site for them which will be up and running soon. “Not only is the school providing qualified crew to the fishing industry, they are continuously supporting local commerce – using local suppliers, using local accommodation etc. and we are pleased to support them as much as possible. The apprentices are our fishermen of the future and we will be looking to them for our produce in the years to come”. “The fishing fleet have recognised the need for qualified crew and are superb in their support of the school – we currently have approximately 30 vessels who support us in training the apprentices – and who we support by supplying qualified crew to them” said Chairman of the school, Arnold Locker, “the school has worked tirelessly over the last five years to meet the rigorous requirements of the Adult Learning Inspectorate and the Learning and Skills Council. The school has also achieved a “Customer First” quality mark and then this September the Pride of Whitby Business Award. There is no doubt the school is becoming recognised for the quality of their training”. During 2006, Whitby & District Fishing Industry Training School was successful in achieving the Whitby Gazette ‘Pride of Whitby Award’. 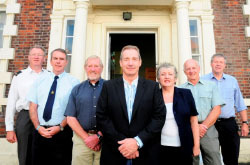 Instigated by the Whitby Gazette, the ‘Pride of Whitby Awards’ were celebrated during September 2006 with the fishing school gaining the top prize in the Business Award category, sponsored by local firm Colin Brown & Kidson. The school was nominated by local restauranteurs Rob and Emma Green of Greens of Whitby whose restaurant is in the centre of town and who use only the best fresh Whitby catch and local game in their menus. Rob and Emma are sponsors of the school and have funded a professionally produced web site for them. “Not only is the school providing qualified crew to the fishing industry, they are continuously supporting local commerce – using local suppliers, using local accommodation etc. and we are pleased to support them as much as possible. The apprentices are our fishermen of the future and we will be looking to them for our produce in the years to come” said Rob Green.